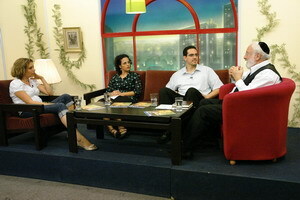 Hagit Telem – project manager at The Bnei Baruch Kabbalah Education Center. Niv Navon – manager of the department responsible for disseminating our materials on the Internet. If we knew the laws of nature and followed them, we would avoid many mistakes. The wisdom of Kabbalah tells us about the forces that operate during the spiritual pregnancy, when our souls are like embryos in the Upper System, and about the forces operating during the birth of our souls. By learning about this, we can understand that when we neglect these forces, we make a newborn predisposed to many problems. Throughout the entire time of the fetus’s development, and especially during the birth process, up until the very last moment of the newborn’s separation from the mother, while he is still connected to her, precisely during the final moments of birth, the mother passes an enormous amount of information (hormones) to the child. Therefore, any interference with the natural processes of childbirth, for example – relieving pain without any special need for it and other auxiliary actions, are harmful for the child. I am glad that medical science is beginning to realize this.